It’s the start of April and one of the best springtime festivals is the Cherry Blossom Festival in Japan. Cherry blossom trees or Sakura trees can be found all over the country. These trees peak at their splendor when the flowers bloom, transforming the landscape into a lush lilac, pink and white field. This marks and celebrates the beginning of springtime, and so the blooming of these trees is highly anticipated in Japan. Traditionally, the members of the royal court would go outdoors and enjoy a picnic under the or ume, waiting for the blossoms to bloom. The practice eventually spread to other groups in society, until it became something that all people did. Flower watching is called Hanami, which transcends into a spiritual activity. This is a centuries old practice dating back to the Nara Period in the 8th century, although records show that hanami festivals date as far back as the third century CE. By the Heian Period, between the 8th to 12th century, the cherry blossoms became the tree of choice, so that practice of hanami became synonymous with Sakura. It reached a point in their written language Haiku and Tanka, that the word flowers means Sakura, which is the word for the cherry blossoms. The festival is celebrated all over Japan. Many of the varieties of the cherry trees do not actually produce the cherry fruit, since these are of the Prunus serrulata variety. 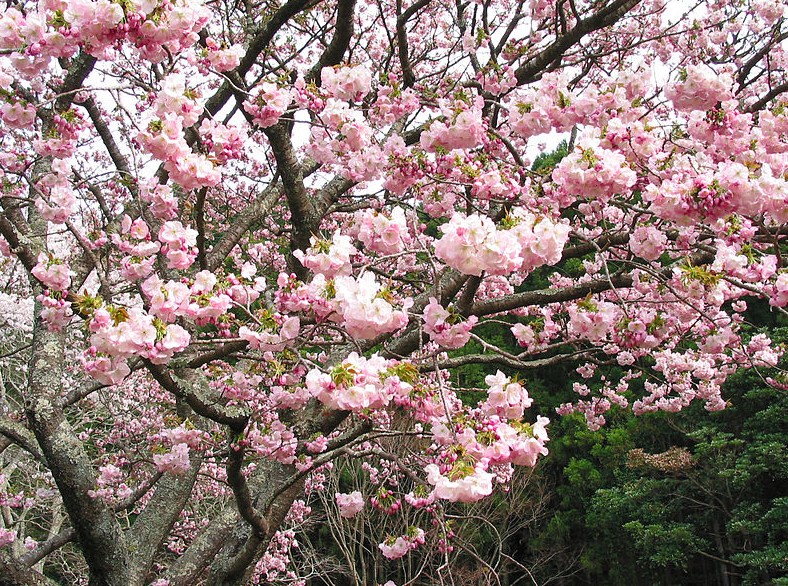 There are over 200 cultivars of the sakura that can be found in the country. The most popular variety is the Somei Yoshino variety, which has white flowers. Another popular variety is the shidarezakura, or weeping cherry. This is similar to a weeping willow tree, although it has pink flowers that cascade down from its branches. The yaezakura is another variety that has large flowers bearing rich pink petals. However, the city’s capital Tokyo, particularly Ueno park is one of the best places to witness the cherry trees in their full splendor. Another popular venue is the Kumamoto Castel Cherry Blossom Festival. People may wonder what’s the big deal about watching flowers bloom. The ephemeral cherry blossoms have come to represent mortality or mono no aware, thanks to the influence of Buddhist culture. Mono no aware translates to “the pathos of things” or “an empathy toward things”. This describes the Japanese idea of having an awareness of the impermanence of things. The cherry blossom is largely symbolic because it is beautiful, yet underlying that beauty is the knowledge that it is not a lasting thing, evoking a feeling of gentle sadness. Perhaps this is the reason why families and loved ones come together and savor the moment by sharing a meal together under the tree and simply enjoying the scenery. As such, the Japanese take the time out of their busy lives to relax and enjoy the moment, as the nature of life itself is fleeting. Today’s celebration of the Cherry blossom festival may not necessarily resemble that of the days of yore although the underlying idea of coming together to celebrate life is still present. There are concerts, musical and performance arts activities, rides, fames and a number of other attractions held during the festival. However, the Japanese are able to seamlessly blend together tradition and change by combining traditional elements with modern day tones. People wear their special kimonos while going around viewing the ikebana or flower arrangements. There are beauty pageants as well as religious ceremonies. The food stalls sell traditional Japanese food items, as well as treats that use cherries as an ingredient. The cherry blossoms in Japan don’t open all at the same time. This means that locals and travelers have the opportunity to see the blooms at their best at various times, depending on the city they are in. The cherry blossoms in Okinawa typically start to bloom in January and the trend happens northward spreading to other parts of Japan. Once the first blooms open, there is a one to two week window to view the cherry blossoms at their best. For this year, the forecast is that the first blooms will open up until April 2 in Kyoto. In Tokyo, the first blooms opened on March 31 and the best time to see these is until April 15. In Osaka, Nara and Hiroshima, the blossoms will open April 2 and can be seen till the 17th. 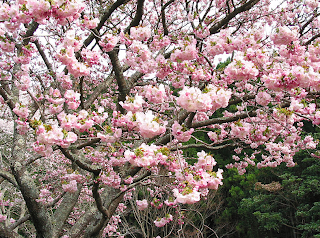 Over at Kanazawa, it is estimated the blossoms will start April 8 and stay open till the 21st. The cities of Hirosaki and Kakunodate have to wait till April 26 to see the opening, while those in Hakodate and Sapporo have till May 4 to 5 to wait for the opening of the cherry blossoms. When it comes to the Cherry Blossom Festival, it’s really true that you can’t keep a good thing. This annual festival is now celebrated not only in Japan, but it has also reached the shores of the United States. In Washington, DC, there is an annual Cherry Blossom Festival that coincides with the celebration held in Japan. After all, these cherry trees found in along the Potomac Washington are cuttings from Japan, which the people of Japan gave as a gift to the US back in 1912. This is thanks to the efforts of Mrs. Eliza Ruhaman Scidmore, who was enamored with the beauty of these springtime blossoms when she visited Japan in 1885. The journey of the cherry blossoms to the US wasn’t an easy one, and it took the combined efforts of several people to actualize the dream. In 1906, Dr. David Fairchild of the U.S. Department of Agriculture brought home 75 samples of these cherry tree cuttings and 25 single flowered weeping varieties. These were obtained from the Yokohama Nursery Company. The plant explorer thoughtfully planted these samples on his property in Chevy Chase, Maryland. Dr. Fairchild wanted to see how the trees would adapt to its new environment. His efforts were met with success! By the following year, the area of Chevy Chase was ready to order 300 of these cherry blossom trees. By 1908, both Dr. Fairchild and Mrs. Scidmore were on a move to push for the planting of these beautiful cherry blossoms in Washington. These were to be planted along a Speedway. Mrs. Scidmore got the influential support of the first Lady, Helen Herron Taft, who had lived in Japan, who instead wanted to get the cherry blossoms planted on a long avenue to heighten its aesthetic appeal. When Japanese chemist Dr. Jokichi Takamine and Japanese consul Mr. Midzuno heard about the plans, they came up with the idea to have the Japanese government in the name of the City of Tokyo donate 2,000 Japanese cherry trees to support the project. This was obviously received with enthusiasm. Ninety Fugenzo cherry trees that were purchased from the Hoopes Brothers and Thomas Co, from West Chester PA were initially planted. The first trees planted along the Potomac River were eventually removed because these trees were incorrectly named and were not the right variety. Fortunately, the 2,000 cherry trees promised by the Japanese government arrived in Seattle, WA in December of 1908. The following month, the plantings arrived in Washington, DC, ready to be planted. Unfortunately, the trees that arrived were infested with insects and had to be destroyed. It took a lot of diplomacy and goodwill to alleviate what would have been a sticky situation. To resolve the problem, the mayor of Tokyo, Yukio Ozaki offered to make a second donation of trees. This time, 3,020 cherry trees would be donated. These cuttings would be taken from the cherry trees found along the Arakawa River, Adachi Ward, which is a suburb of Tokyo. At the same time, these would be grafted to a variety from Itami City in the Hyogo Prefecture. It was in 1912, when these specially grown cherry trees reached American shores. On March 27, the ceremonial planting of the cherry trees were presided by first lady Helen Herron Taft and the wife of the Japanese Ambassador, Viscountess Chinda. The first two trees were of the Yoshino variety and planted on the north side of the Tidal Basin. To show appreciation for the generous gift, the US first lady handed a bouquet of American Beauty Roses to the Viscountess. Today, there is a plaque that identifies these first two trees that still stand today and can be found near the John Paul Jones Memorial. The first Cherry Blossom Festival in Washington was held in 1935. The festival reenacted the planting of the first trees and the interaction of the two women. By 1940, a Cherry blossom Pageant was held. In 1948, the festival took another turn with the introduction of Cherry Blossom Princesses. These beautiful women represented each State and other Federal territories and after a careful selection process, a Queen would be chosen who would reign over the festival. By 1957, Mikimoto Pearls, Inc. donated the Mikimoto Pearl Crown, which the reigning queen gets to be crowned with. This spectacular piece is made of 1,585 Mikimoto pearls set against two pounds of gold. In 1965, another 3,800 Yoshino cherry trees were donated by the Japanese Government to the American people. This time, First Lady Bird Johnson, and Mrs. Ryuji Takeuchi, wife of the Japanese Ambassador, presided over the planting ceremony. There have been subsequent additions to the cherry trees over the years. Throughout its history, the cherry blossoms in Washington have served as a tangible link of friendship between Americans and the Japanese. Various propagates of the cherry trees have been sent back and forth between the two countries to preserve the genetic lineage of the trees. At the same time, whenever there is a need for new cherry trees, one country sends a fresh horticultural supply to the other. For example, in 1982, the American government sent the Japanese government trees from Washington to help replace the damaged trees in Japan. In 1994, the National Cherry Blossom Festival was extended. Instead of being celebrated for a week, it is now a two-week annual celebration. The annual event is organized by the National Cherry Blossom Festival, Inc., and over 700,000 people come to witness the celebrations, which range from concerts to fireworks displays. It is celebrated beginning the last Saturday of March and is marked by a number of activities, such as the Blossom Kite Festival, a sushi and sake celebration, art exhibits, a kimono fashion show, martial arts and a number of cultural performances. During the last day of the festival, there is a parade, which ends with the Sakura Matsuri-Japanese Street Festival. This is the largest Cultural Festival in the country. Who knew trees could change the way people interacted? The influence of the Japanese way of life, especially when it comes to the cherry blossoms has reached the shores of other countries. This shows the strong influence of the Japanese culture to other nations. Seems like anywhere there a cherry blossoms, a festival of sorts will be celebrated. In China, the East Lake Cherry Blossom Garden is home to one of the largest cherry blossom festivals outside of Japan. It is natural to have a cherry blossom festival in China, since the country is a natural growing place of these magnificent trees. There are over 5,000 cherry trees in the Wiuhan suburb of the Hubei Province. This festival lasts for 25 days. In Seoul, Korea, the Yeouido Spring Flower Festival is held during the second week of April. Over 1,400 cherry trees can be found on Yungjungo Avenue. The event is marked by a parade, street performers and other celebrations. In Australia, there is a Japanese Garden that was developed after World War II to commemorate the prisoners in Cowra, which was the site of the largest prison escape of the Second World War. The Cowra Japanese Garden is the biggest of its kind in the southern hemisphere, and covers 12 acres of land featuring landscape styles of the Edo period. Unlike in Japan and the US, the Sakura Matsuri or Cherry Blossom festival is held in September. Japanese immigrants also brought the cherry trees to Brazil. In fact, São Paulo State in Brazil is home to the largest number of Japanese residents outside of Japan. There are cherry blossom trees at the Botanical Garden of Curitiba, as well as in Japanese Square. In Canada, the Vancouver Cherry Blossom Festival is held annually. Just like in the US, cherry blossom trees were donated by the Japanese government to the People of Toronto, which is why there are Yoshino cherry trees in High Park. There are also celebrations in Europe. In Germany, a cherry blossom festival is celebrated in the Altes Land Orchard region. Hamburg is the city with the largest Hamani festival in the country. In the Netherlands, The Japan Women’s Club also donated cherry blossom trees and these can be found in Amstelveen. The 400 trees have been given female names, half of which are Japanese while the other half is Dutch. In any place of the world, the Cherry Blossom Festival has become a time of celebration and a reminder of life. It’s a time to take stock of things, welcome the springtime and to take a moment and enjoy and come together with friends and loved ones.